This document details functionality of v1.0 of the Information Machine API. Information Machine’s API is designed to be REST-ful; its URLs follow predictable patterns and responses carry appropriate HTTP response codes, among other features that characterize the REST architectural style. All requests made to the Information Machine API must be URL encoded. All responses from this API, including error messages, will be returned in JSON format. Before you write any code, make sure you create your free Information Machine account to retrieve your API credentials , i.e., your API key and API secret. Be careful never to publish your API secret key as it uniquely identifies your account and will allow anyone with your API key to gain access to your account. If your API details are compromised, please contact us immediately. An API Resource with which you wish to interact, e.g., products, categories, stores, etc. Authorization which consists of client_id (your API Key) and client_secret (your API secret) which you can get from your dashboard. Best way to learn an API is from an example and in this example we will see how response looks like when calling /v1/products endpoint. The below url will get products which have matching UPC/EAN number, this is represented as product_identifier=014100044208 query parameter. The above response does not show all properties. There are more properties in this response which you can explore using the Interactive Docs page. From the response above you can see two major data properties, "Result" and "Meta"
page if result data is an array of objects. per_page if the request returns an array of objects then this property contains the number elements per page in the given array. total_count if the request returns an array of objects then this property contains the total number of elements. next_page and last_page are url links to the next page and last page given the current request. max_number_of_requests_per_day contains maximum number of requests per day. remaining_number_of_request contains remaining number of request that you can make in the next time_in_epoch_second_till_reset seconds. time_in_epoch_second_till_reset time till the next request counter reset. The easiest way to make requests to the API is to use one of our many client libraries. We recommend that you use these libraries since they absolve developers of the need to explicitly handle authentication and request construction. The GitHub repositories for these libraries provide detailed explanations for making your first request. Information Machine uses conventional HTTP status codes to indicate success or failure of API requests. In general, codes in the 2xx range indicate success, codes in the 4xx range indicate an error that resulted from the provided information (e.g. a required parameter was missing), and codes in the 5xx range indicate a network or server error. The response text for error conditions typically contains four fields in the supplied JSON response, message, max_number_of_requests_per_day, remaining_number_of_request, time_in_epoch_second_till_reset, which describe in further detail the error that has occurred and how many requests are left on your account. The best place to learn the Information Machine API is to use our Interactive API playground to construct requests and explore the data. IM user is entity referred by other IM API artifacts (store connections, bar code scans, etc.). Pair of client_id/client_secret keys, can create as many as needed IM API Users. It is must have for majority of "user" based actions. In order to created IM User, you'll have to specify unique "user_id". Only alphanumeric characters, underscore, hyphen and dot are allowed in "user_id". In order to update IM User, you'll have to specify unique "user_id". Only alphanumeric characters, underscore, hyphen and dot are allowed in "user_id". You can always list your user(s) by using a get method on users resource. You can get user information by providing user_id. Delete user and all her/his store connections and associated data. User store connection provides continuous stream of purchase data (historical and future). Connection is created via valid set of credentials (username/password). Check "Lookup/Store" section, in order to get list of stores available (only those with "can_scrape" = true). Store connection is created through API with username/password provided in request. On successfully created connection, you'll receive ID that uniquely identify your connection. In order to check credentials (store connection) status, you'll have to use GET method explained in "Find" section. Using user ID you can get all store connections for a specific user. Using user ID and store connection ID, obtained during store connection creation, you can find store connection and get detailed information about it ("Not defined", "Verified", "Invalid", "Unknown" & "Checking") and scrape status ("Not defined", "Pending", "Scraping", "Done" & "DoneWithWarning" ). Store connection information also contains two important aspects of a store connection, whether it is locked and a url to unlock the connection. You can delete you store connection, specifying store connection ID, obtained during store connection creation. Update of existing store connection is also possible. You can change both username and password. Sometimes the username and password are not enough. Some stores (Amazon, Walgreens...) could lock the account and display a security question, image captcha or something else. From this moment on, we cannot get your purchase history until a user unlock its account. For this purpose, store connection information also contains three important properties, whether it is locked (account_locked), the reason why it is locked (account_lock_code) and a url to unlock the store connection (unlock_url). First check if the account_locked is set to true, if so present the user a url that is stored in unlock_url property of store connection. "Security Question" - this means our data bot has encountered a security question during login and connot go further without an answer to a security question. Once answered, the answer will be stored and the account will never be locked again beacuse of security question. "Image Captcha" - our data bot can not process image captcha so a user must assist in answering the image captcha. "Incomplete User Profile" - Site is asking a user to confirm something (new terms of service etc.) or complete the profile such as entering a missing zip code, reset the password etc. Please note that we do not support unlocking of incomplete user profile. The user should go to the website of the particular store and complete its profile. Once this is done the bot can scrape purchase history. "User Account Deactivated" - User's account has been deactivated by a website that we scrape. User needs to go to a particular store website and see further instructions on how to re-activate the account. Once the user answers security question the account is unlocked and will be scraped shortly by our bots. We can get data from receipts provided only receipt number and receipt purchase date. Currently this functionality is only supported for Walmart and H-E-B stores. receipt_id should not contain any spaces in between characters. Please note that receipt_date is required by Walmart store, and it should not be older than 7 days. For H-E-B store if receipt_date is not specified then we will use current date as purchase date for that receipt. Processing H-E-B receipt is usually a few minutes. But processing Walmart receipts can take up to several days. "Processing" - This means our data bot will try to get the data in the near future. For Walmart this status can be present for several days. It really depends on Walmart. "Done" - Receipt data is fetched and stored in our database. Also purchase_id is populated. "Failed" - There were one or more errors while trying to get the receipt data. This might include: Invalid receipt date or receipt id, databot has timed out when fetching the data (the store server is down for some reason or currently is not processing receipt requests), other bad requests made to the store server. We will try to scrape these "Failed" receipts whenever databot for this user store is activated for scraping event though the status is marked as "Failed". One store connection can pull "online", "loyalty" or "online & loyalty" purchase stream. It varies from store to store (marked in list below). E.g., Walmart store connection (store id: 3) pulls both online and loyalty purchase stream. On the other hand, Safeway (online) and Safeway (loyalty) are separate infrastructures, i.e., separate store ids, 50 & 1041 respectively. In order to pull both "online" and "loyalty" purchase streams, two connections are required. Stores not listed below are supported through paper receipt images & bar code scans. It is possible to associate barcode to IM user account. API response contains product data for provided barcode. Execution might take up to 15 seconds, depending on whether barcode exists in database or IM services must gather data for uploaded barcode. Another way (besides scrape bots) of associating purchases with user. If store does not have online shopping section, you can take a photo of your receipt and upload it via receipt upload engine. Receipt is typically transcribed within 24h time frame. If receipt is long, split it, and upload in multiple upload requests, each having same "receipt_id". Receipt image can be splitted in up to 10 components. Purchase represents entity that is equivalent to invoice, delivered into IM database via harvesting bots. It is composed of basic invoice properties (purchase date, store [where purchase is made], total & tax) and individual purchase items (name, quantity, unit price, image, UPC, etc). Purchase item properties may vary from store to store. However, purchase item name & price are pretty much always captured by harvesting bots. Product is entity non related to actual purchase items, i.e., harvesting bots. Each is composed out of many properties. Name, UPC/EAN/ISBN, image, ingredients, nutrition card, etc.. Often, same product has different (purchase) name in various stores. Information Machine works hard on bringing all these purchase items under the same parent, i.e., Product. Each Purchase Item is connected to a Product, which expands its rudimentary set of properties delivered via scrape bots. Check our Swagger documentation, "UserPurchases" section, for available purchase (purchase item) query parameters and filters. 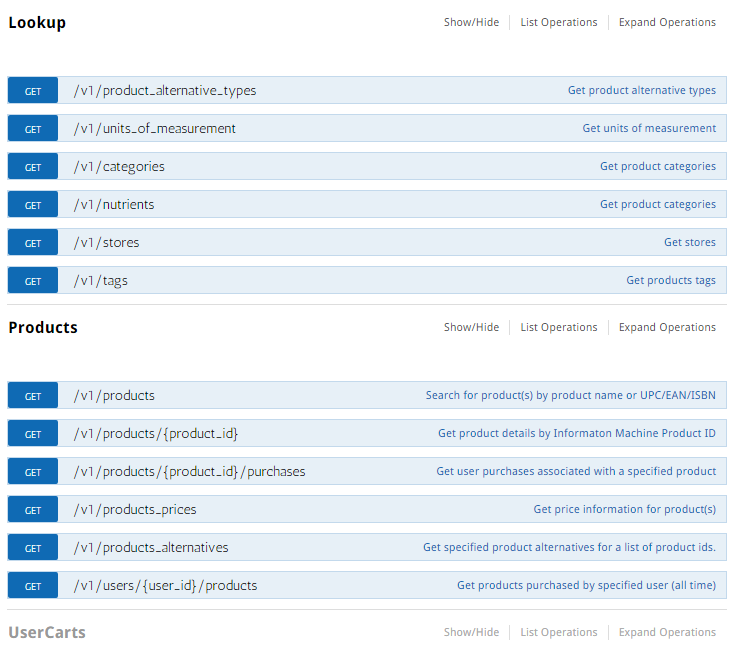 Check our Swagger documentation, "Products" section, for available product query parameters and filters. This set of API methods expose lookup based (id -> name) tables. List all alternative type IDs available. List all unit of measurement IDs available. List all category IDs with parent/child structure. List all available nutrients in IM infrastructure. List all stores in IM infrastructure. Those with "can_scrape=true" are eligible for purchase harvesting via scrape bots. See "UserStores" swagger section. List all supported tags (organic, gluten free, vegan, etc.). If you do not want to "poll" our API on a regular basis to get the newest purchase data from your users, then you can use our Webhook and we will notify you when new purchase data is available. So, as soon our data bots finish scraping the users purchase history you will be notified with scraped data. To configure this webhook go to your Dashboard page, select Webhooks tab, enable "User Purchases Webhook" and enter your URL where would you like us to send the purchases to. Finally click Save button and that's it. "idempotency_key" uniquely identifies every webhook sent from Information Machine servers. If you do not want to "poll" our API for credentials status, you can subscribe to webhook. As soon our data bots resolve credentials status, you will be notified. Also, we'll notify on every future store connection status update. store_connection_id (type:long) – ID of store connection (returned by IM API). credentials_status (type:string) – Status of credentials. “Verified”, “Invalid” or “Unknown”. account_locked (type:bool) – Lock status of store connection. user_id (type:string) – ID of user in IM system. account_lock_code (type:short, NULL-able) – Lock code type (details below). unlock_url (type:string) – URL you should open to unlock account. username (type:string) - Store connection username. idempotency_key (type:string) - Unique request ID. account_lock_code property indicates type of lock enforced by retailer. Should be available if account_locked property is set to true. List of available codes below. IM Webhook service will try to reach destination three times, before final abort.